Museum resources (and other vetted websites) to support youth services in libraries and schools. The past few months have been stressful: new job, holidays, and fighting all the germs kids bring with them to the library. So I wanted to find something fun and different to feature for January. 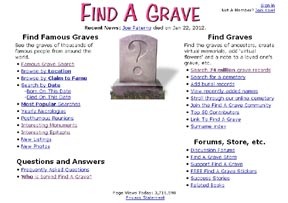 Well, I found something unique and addictive in a disquieting way: Find A Grave (www.findagrave.com). Images of the memorials and headstones of the rich, famous and infamous are of course included on the site, but biographies of the individuals are also shared. While I can't speak to the accuracy of the biographical information, it would at least provide interesting tidbits to encourage further research. My searches included one celebrity whose grave I wanted to confirm and one infamous federal agent buried in the same cemetery as John D. Rockefeller and President Garfield. 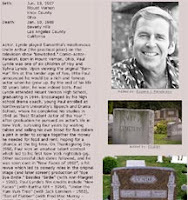 While driving back roads through central Ohio years ago, my husband and I saw a gravestone that marked the resting place of Paul Lynde. Could it be true?!? Is "Uncle Arthur" from the television show Bewitched actually buried near Mount Vernon, Ohio? Well, according to the good folks at Find A Grave, it is, indeed, the final resting place of the comedian. I also searched for Eliot Ness, a T-Man whose Untouchables brought down Al Capone. I've visited Cleveland's Lake View Cemetery many times (President Garfield is buried here: the only President of the United States whose coffin is displayed for the public to see; Wade Chapel is a must-see: Interior designed by Louis Comfort Tiffany). 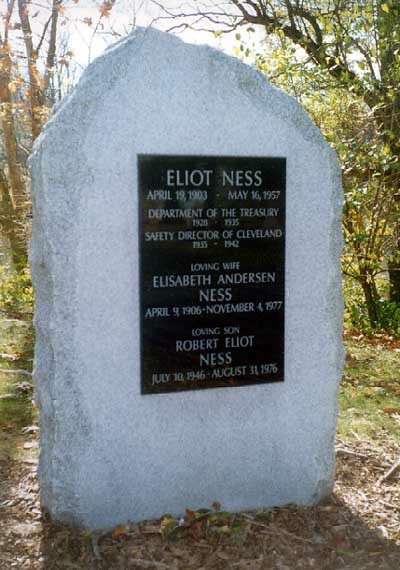 I'd heard that Ness is buried here, but was blocked from viewing his grave by road crews. Well, here it is! Of course, I'll visit again as soon as I can. Aside from the graves of the rich and famous at Lake View, walking through the cemetery is like walking through Cleveland's history. I bet you can find similar spots in a city near you that provide an opportunity to discuss local history in a unique way. If you can't leave home, or if the folks you'd like to visit are too far away, I recommend a virtual visit through Find A Grave. I am a recent graduate of the School of Library & Information Science at Kent State University. As a recipient of the "New Vision of Learning" scholarship from The Laura Bush 21st Librarian Program and IMLS, I am committed to bridging the gap between museums, libraries and children to provide informal learning opportunities. I am married and have two children, who are often the guinea pigs in my museum quests! The Institute of Museum and Library Services is pleased to announce funding for the Museum Assessment Program. Words on Words by Maggie Stiefvater - My Final Book Tour Post! ¡Es divertido hablar dos idiomas! Museums as Library Resources blog by NKM is licensed under a Creative Commons Attribution-Noncommercial-No Derivative Works 3.0 United States License.